WorldWorksGames Roll Arena is the must have accessory for all role players! 100% system generic, the Roll Arena elevates dice throwing to a whole new level! A variety of arena inserts are included, allowing you to define hit locations or resolve randomized symbol based outcomes. Swap them out as needed! Includes completely editable system cards which match each arena symbol, allowing you to define conditions based on your unique needs. A card drawer plus two dice drawers finish off the perfect dice throwing solution for your next game! Preview the instructions here to see how it all goes together! This set also includes GSD files for owners of Silhouette or Craft ROBO cutters. I’ve had a chance to make the roller arena myself and I really enjoy it! You can add your own text to the cards which is really handy for personalising your games! Here is a picture of the Roller arena I built. I’ve customised the cards for my GURPS game and come in quite handy! So check out the Roll Arena and see what other people are saying about it! Profantasy The Cartographer’s Annual 2011 July issue is a paper diorama of mines. The July issue of the Annual 2010 a customizable mine diorama that you can print and assemble as you need. Created with Dioramas Pro, it also shows off many of that add-ons features without the need of actually owning it! The style contains 14 A4/Letter pages of Dioroma goodness. Ech of these can be customized on its own, and together they allow you to build almost any mine layout. The accompanying mapping guide gives hints and tips for customization and assembly. You must own Campaign Cartographer 3 and a subscription to the 2011 annual to use them. I’m hoping that this will mean an upcoming Dioramas 3. I’ve been pushing for an update for Dioramas and Character Artist (for paper figures) for months now. Codename Titan marks WorldWorksGames first sci-fi installment in the TerrainlinX lineup. This first component-zone focuses on essential corridor infrastructure and general building or starship construction. Perfect for representing both interior and exterior sci-fi structures of any footprint or height. Our TerrainlinX build system, with its ability to store flat, add & remove elements on-the-fly, dynamically mix and match elements from other terrain sets, create easy “lift-off” levels, and complete “Robo-cutter” compatibility, makes Codename Titan one of the most flexible sci-fi terrain systems on the market today! And this is just the beginning! Future installments in the Titan line will seamlessly integrate additional component-zones to cover all your classic sci-fi infrastructure needs. Finally! Let’s finish this sucker up. You might want to reread the first two parts which deal with construction and painting. Welcome Back! 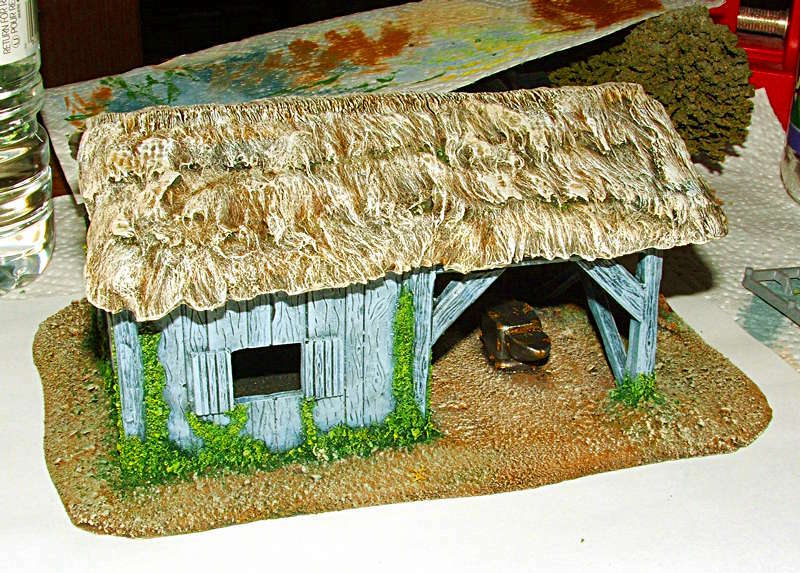 This is part 2 of my 3 part mini-series on building Cellar Dweller’s Blacksmith shop. It’s been a while so you may want to reread the first part which deals with the actual construction of the model. This part is concerned with the painting and Part 3 will deal with “finishing”. (You thought painting it was the end? I was asked to write a "how-to" on making plants out of sprues. "What are sprues? ", you ask. Sprues are the plastic frames that multipart models or minis come on. Most people cut the pieces off and throw out the frame. Not me. I never throw anything out (much to my wifes displeasure). I wasn't going to write this up because it's insanely easy and fast. I have a confession to make. I LOVE Styrene. There, I said it. Please don’t think less of me. I’m just a hack when it comes to working with this stuff. I don’t have the best tools and I certainly don’t worry about scale. I build for look and functionality. List of materials and tools is simple: Different shapes of styrene (described in the article), plastic glue, side cutters, ruler, pin vice (hand drill), razor saw & miter box.